It was a hot one out there today! Lots of water went down today. We just about finished up the kitchen remodel in Norton Shores. We will be heading back tomorrow to install the last piece of counter top and trim. A couple of us went over to another Norton Shores home to install a couple new windows in a garage. Be sure to stay tuned for upcoming info on new replacement windows exclusive to West Michigan offered by Chandonnet Builders LLC! 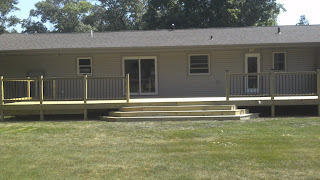 We finished up the 16'x48' deck in Norton Shores today. It turned out real nice with painted black aluminum balusters. We also got the cabinets installed today for the kitchen remodel in Norton Shores. We have been working on three different projects over the past few weeks. We put the finishing touches on the remodel out in North Muskegon. We have been working on a 32'x 40' pole barn with 14' walls and a 12' lean to. That one is all built and the steel siding is just about completed. We have to wait to do the front on that one while the concrete gets poured. We also have a kitchen and bathroom that we gutted in Norton Shores and remodeled. 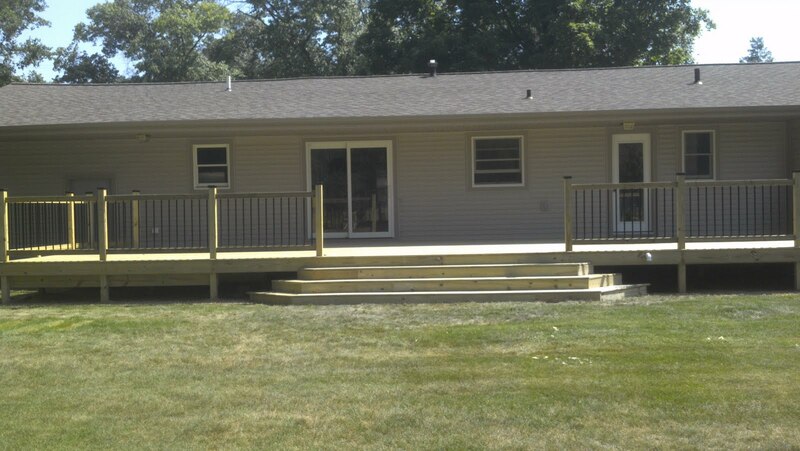 The last thing is a 16'x48' deck in Norton Shores. It's been beefed up to hold a hot tub on one end. We will be finished up with that tomorrow. We will be finished up with the exterior remodel in North Muskegon tomorrow! New windows, siding, two new composite decks, new garage door, and covered front porch addition. Came together real nice. We will have photos up real soon! Next we will be starting a 32'x40' pole barn in Robinson Township with a 12' lean to. We are just about there on our remodel project in North Muskegon. We have a couple more hours to go and the composite decks will be complete. The new windows arrived today and will be getting installed tomorrow. We will also be pouring the new concrete approach to the garage tomorrow. We finished up the siding on our remodel in North Muskegon today. We also finished installing the composite decking on the new back deck. Tomorrow we will install the composite railing and trim boards. The new windows should be here any day and we will also be pouring a new concrete approach to the garage. we are nearing the end of this one! We just about have all of the siding installed at the exterior remodel in North Muskegon. We should have that aspect of this project finished up tomorrow. We also started installing the hidden fastener composite decking, we got about half of that done. We will be installing a new garage door, new concrete pad in front of the garage, and new windows and this one will be complete.